Through the wastewater treatment process, there are components left over that are separated from the liquid phase. This collection of leftovers is referred to as sludge, which is then further treated within tanks. At Microbial Discovery Group (MDG), we have explored the process of treating sludge within sludge tanks and have designed our Biotifx® products and program to assist with this treatment and ongoing maintenance. As a first step when we begin partnering with a new sales rep, we find it’s always helpful to start or refresh with the basics. 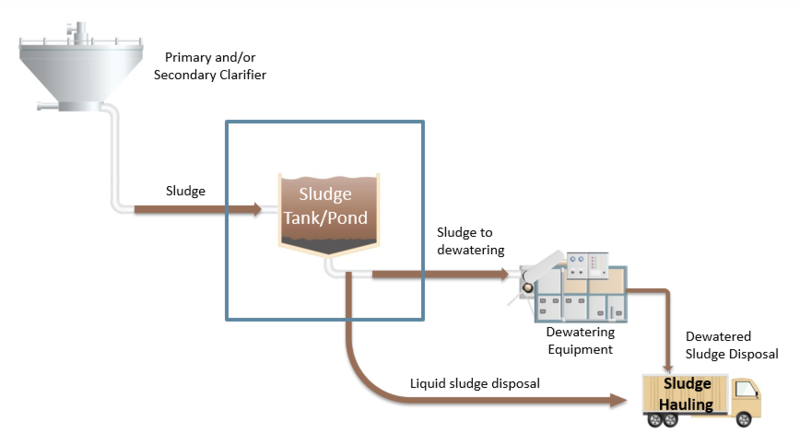 Sludge itself is defined as a mixture of liquid and solid materials that have been removed from the treatment system. Essentially, it is the waste of the wastewater treatment process. Sludge is comprised of both inorganic and organic matter. After leaving the clarifier, sludge is transferred to designated tanks, which accordingly are called sludge tanks. These tanks can also be referred to as a sludge thickener, pond, decanter, or digester (not to be confused with an aerobic digester). After the sludge finally leaves the tank, it is dewatered through a sludge press and is hauled away. Sludge tanks are also utilized because they allow water treatment facilities to remove and store larger liquid and solid masses of waste, so they can then continue treating wastewater in a more efficient manner. Increase digestion. By increasing the contact time, biology can continue to further digest the organic components of sludge. Thicken up the sludge by separating the liquid from the solid components. Using gravity, sludge settles at the bottom of the tank and water can then be decanted, or removed, off the top. Act as a storage container of sorts before being sent for pressing and disposal. While sludge treatment is an essential part of wastewater treatment, the tanks come with some concerns surrounding their upkeep. Disposal Costs: When sludge is ready to be disposed of, it is carted off on trucks. Much like your mail, the sludge is measured and priced by weight. The heavier the sludge is, the higher the disposal costs. If you work to reduce the mass through digestion, disposal costs will decrease. Odor: This challenge comes as no surprise for anyone who has had the experience of visiting a wastewater treatment plant. After all, sludge is the leftover waste of wastewater. Community complaints and regulatory fines can cause problems for cities and facility operators. While there are many causes of foul odor in sludge, one undesired offender is hydrogen sulfide (H2S) gas. This deadly gas is responsible for an unpleasant rotten egg smell and can cause health safety risks for facility operators. Poor Dewatering and Inefficient Pressing: To reduce weight in the sludge being hauled, operators employ a few different methods to remove water from the sludge composition. Because wet sludge is heavier than dry sludge, it is important to remove as much as possible. To do this, facilities will traditionally use costly polymers to improve the settling and separation of water and sludge. Limited Capacity: Sludge tanks can only hold so much sludge before they run out of room. Especially when digesting and settling sludge, the process at times is not able to keep up with the amount of sludge coming in from the clarifier. To combat this, facilities will often increase their capacity by building new infrastructure, which means more tanks. When you’re able to improve digestion, you increase the amount of room available within and avoid the need to allocate money for additional tanks. MDG’s research and development team worked hard to create an innovative product that would enhance the efficiency within sludge tanks. The full line of Biotifx® products is formulated with unique blends of Bacillus, enhanced with a proprietary blend of micronutrients and biostimulants to maximize performance for their specific goal. Biotifx® ST is the product specifically designed for sludge tank applications and focuses on increasing sludge digestion and improving dewatering. In addition to a great product, we developed full programs that take all the guesswork out of treating with bioaugmentation. We want to ensure success every step of the way, so our Biotifx® platform was designed around creating a partnership between our technical experts and our distribution reps. We provide hands-on service along with tools that accurately report on results over time. Results with Biotifx® are real, and we enjoy working with our sales reps in the field to demonstrate impact through high ROI for their customer. In conclusion, sludge tanks are an important part of the wastewater treatment system, but they come with their challenges. MDG partners to help fix these issues so that sludge tanks can efficiently store and digest solid and liquid waste. This makes money for our partners and results in a high cost savings for their customers. Are you interested in hearing about how we can increase your customer’s capacity without a single dollar spent on new infrastructure? CONTACT US to learn more about our Biotifx® Program.